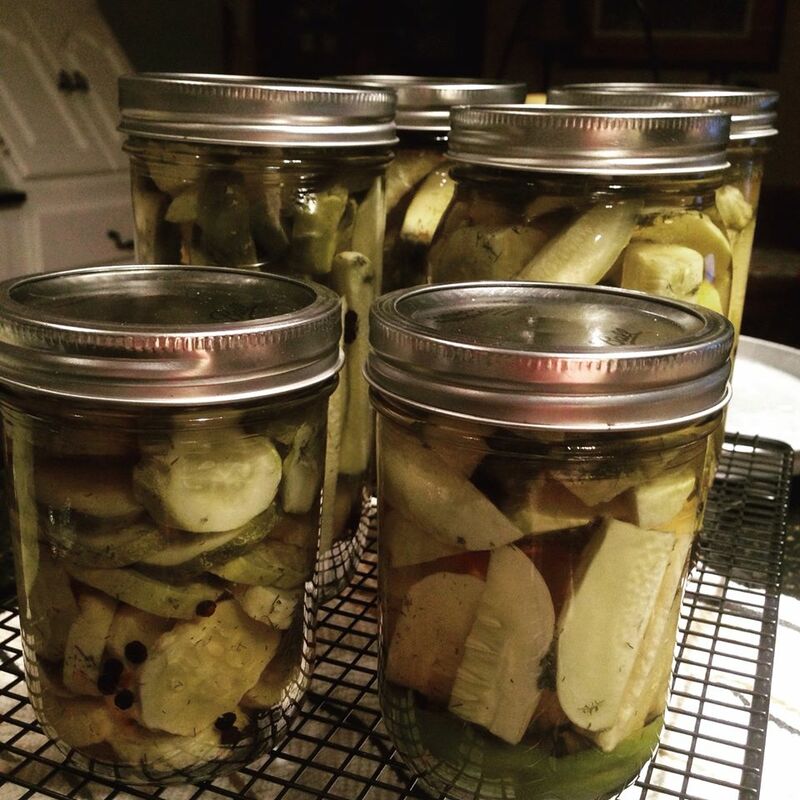 If we get snowed in this winter, one thing we will not have a shortage of is pickles. I’ve made so many pickles this summer I feel like I might turn into a pickle. As I mentioned a few weeks ago, I have canned grape leaf pickles, spicy garlic dill pickles, fermented pickles and hot sriracha pickles. 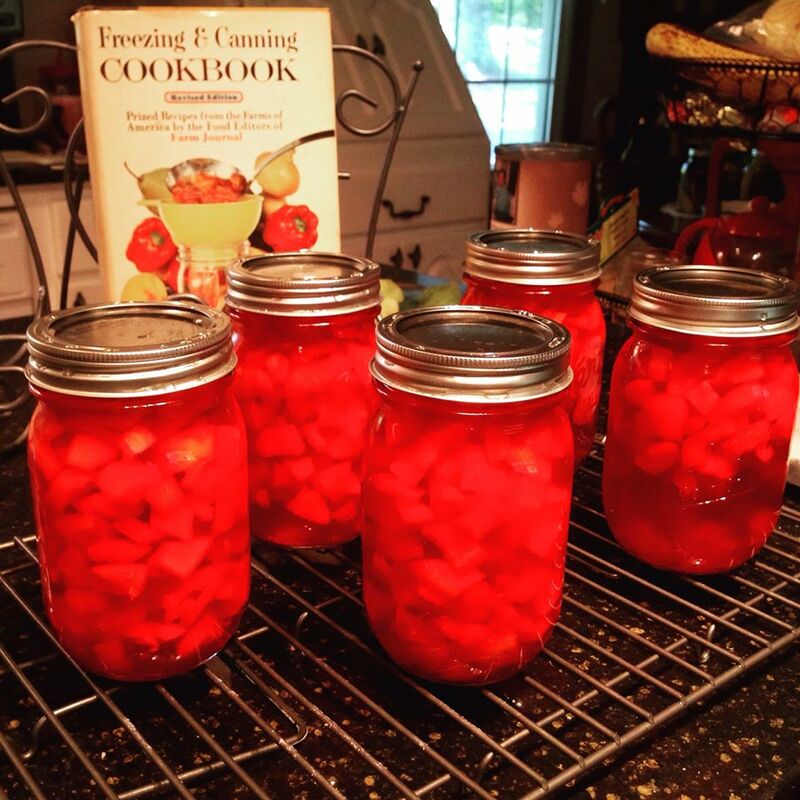 I’ve also done a few experimental pickling projects this summer. A few weeks ago my friend Josh asked if I’d ever made pickled okra. I hadn’t and he gave me some to try. I recently read a really great article on okra from Our State magazine, the article mentioned eating okra raw. Now, I know okra is one of those love or hate foods for most. I like it fried and in gumbo, but eating it raw, I’m just not sure I’m that brave. I’m actually not even sure I’m brave enough to eat it pickled, but Josh was so I gave it a shot. Josh so enjoyed my spicy sriracha pickles that I thought I would try pickling the okra with the same recipe. He said it is delicious and he’s already eaten almost an entire jar of them. I have to agree with his wife, however, who refers to whole okra as “alien fingers.” They did look rather intimidating and alien in the jar with the red sriracha brine. 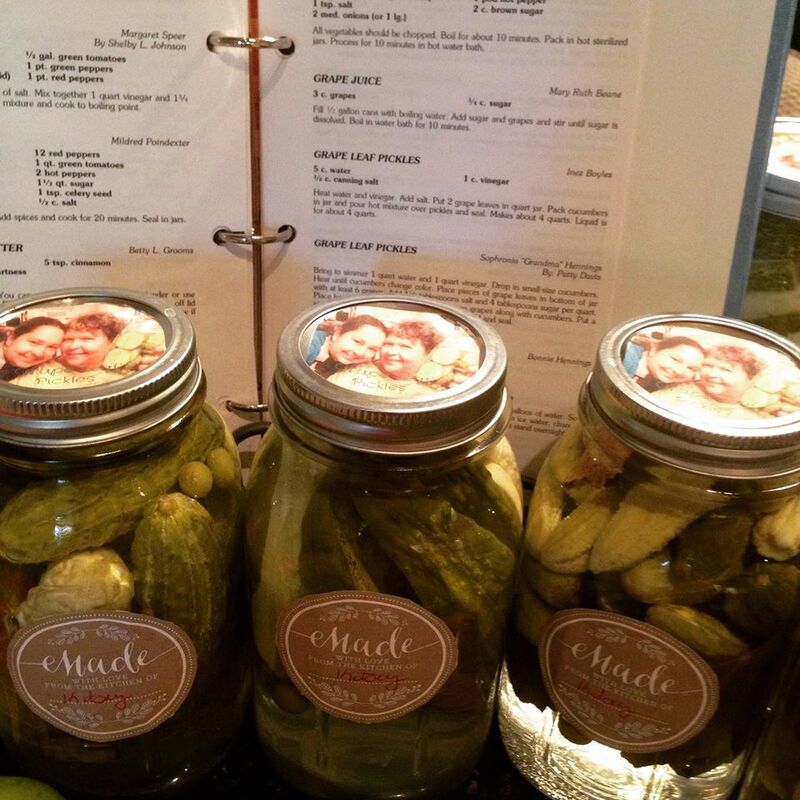 Another pickling experiment I have been wanting to try for a while is a recipe called cheerful sweet pickles which I found in an old canning cookbook. Part of what intrigued me about the recipe is that you make it using those cucumbers which ripen under the vines before you see them and end up getting as large as footballs. I had several of these the other week and really didn’t want to waste them. The other intriguing part of this recipe is that it calls for Maraschino cherries. The process for the pickles takes three days. On the first day, the large cucumbers are seeded, chopped into cubes, covered in salt and left to sit overnight. The next day, the cucumbers are covered in a brine of sugar, vinegar with cinnamon sticks and cloves. On the third day, Maraschino cherries and some red food coloring are added. Sweet pickles are not usually my favorite, but these look so lovely I just couldn’t resist making some. The cookbook I used said they are great served with pork or roast or chopped and added to cream cheese to make a spread for sandwiches. Directions: Peel, seed and cut cucumbers into cubes. Sprinkle cucumbers with salt and cover with water. Let stand overnight. In the morning heat to boiling and then drain. Loosely tie spices in cheesecloth and combine with sugar and vinegar. Heat to boiling. Pour over drained cucumbers and let stand overnight. The next morning heat to boiling and then simmer until cucumbers are tender – being careful not to overcook. Add cherries with juice and red food coloring. Ladle into hot, sterilized jars and seal at once. Process in boiling water bath (212 degrees) for five minutes.